If you’re invested in stocks, you’re susceptible to volatility. 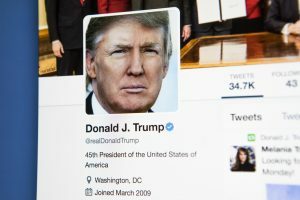 In other words, if there are selloffs and heightened volatility in the S&P 500 Index, chances are your portfolio would suffer. Now, mathematicians, physicists, and other geniuses of the world figured out you can actually structure volatility as products. Thereafter, VIX trading was born. Traders and investors could now gain exposure to the CBOE Volatility Index (VIX), which tracks the expected volatility of the S&P 500 Index, by trading ETNs like VXX and VXXB. That said, let’s get right into things and look at the VIX, VXX, and VXXB. Now, the Chicago Board Options Exchange (CBOE) introduced the first exchange-traded VIX futures contracts back in 2004. Just 2 years later, CBOE introduced VIX options. Consequently, this allowed sophisticated traders the ability to trade and potentially profit off of volatility. The VIX Index uses a mathematical formula to come up with a value. Don’t worry, we won’t be going over Ph.D. level math here. You just need to understand that the VIX Index is comprised of options, not stocks. You see, options have a volatility component, unlike stocks. Option’s prices reflect the market’s expectation of future volatility. 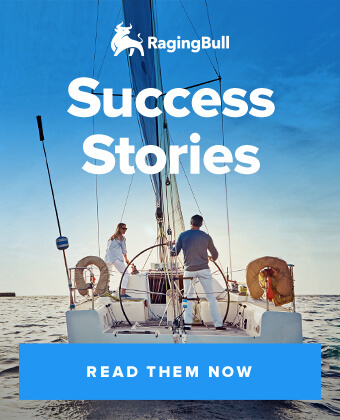 Now, if you don’t know anything about options, don’t worry – you can learn options trading in as little as 30 days with this guide. The VIX Index serves as a barometer for the expected volatility of the S&P 500 Index over a 30-day period. The VIX components include near- and next-term puts and calls with at least 23 days, but less than 37 days, until the expiration date. The options are also out-of-the-money S&P 500 Index (SPX) calls and puts, which are centered around the at-the-money strike price. 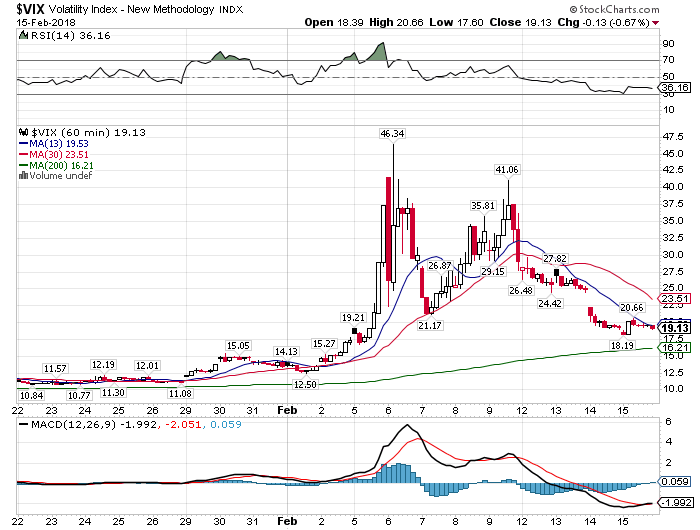 Keep in mind, when this volatility in the markets, the calculations of the VIX could get out of whack. For example, we saw how crazy VIX got back in February 2018. The VIX spiked over 200% in just a few days. Those who were short volatility didn’t see this extreme event coming. However, if they had seen this indicator, maybe they would’ve been able to prepare for the spike in volatility. When you’re learning how to trade VIX products, understand that volatility has unlimited upside potential. In other words, volatility could spike and move extremely just as it did in 2018. Additionally, volatility is often thought to be a mean-reverting asset. However, that doesn’t mean volatility can’t stay high for a long period. That said, there are ways to profit off of crashing stocks and volatile markets. This brings us to VXX. 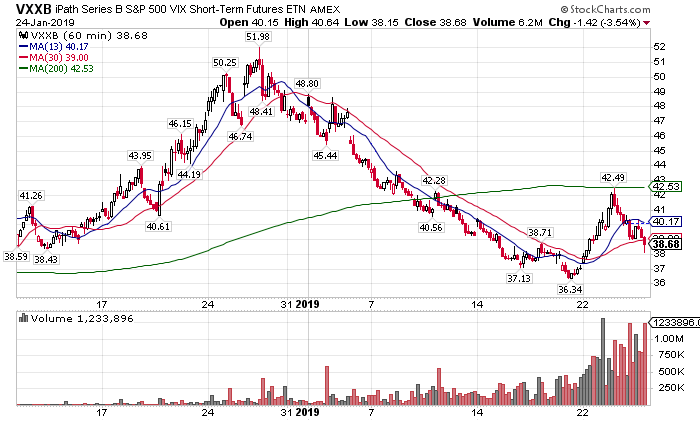 Take note – VXX is maturing on January 30, 2019. That said, this volatility product will no longer be traded after that date. Barclays – the exchange-traded note (ETN) issuer – will conduct the final valuation for VXX the day before the maturity date. Now, if you’re long VXX and want to figure out what to do with your shares, check it out here. Moving on. VXX was one of the first ETNs that provided exposure to S&P 500 Index volatility. VXX trades like a stock, with a bond component. You see, VXX could have been bought, sold, or sold short during pre-market, market, and post-market hours. This ETF was trading with an average daily volume of over 70M shares a day – making it extremely liquid with tight bid-ask spreads. Additionally, VXX had options available. However, unlike a stock, VXX had a maturity date. In other words, it had an expiration date – which was set just 10 years from its issue date. Now, VXX was designed to track the daily percentage changes in the VIX. That said, this product was the life blood for many volatility traders for many years. 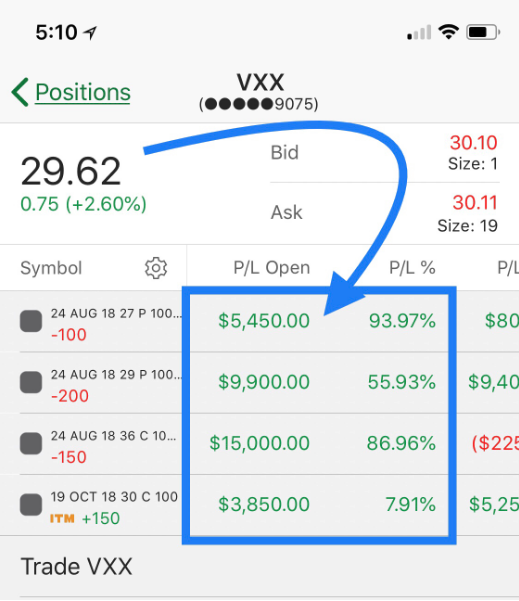 Heck, I was able to generate profits like these in VXX options. If you look above, I was able to put on bull call spread trades on VXX. Moreover, I was able to generate profits placing directional bets on the VXX, as shown above. 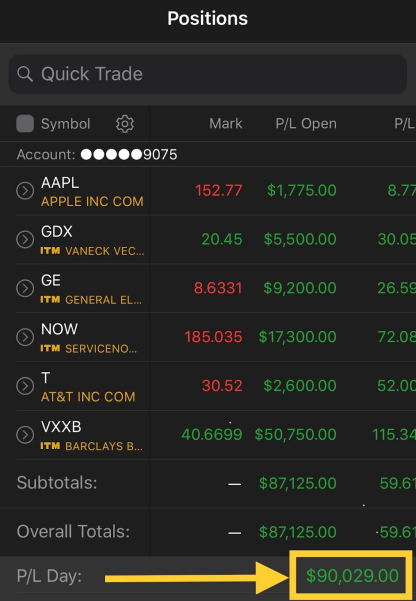 Now, if any of these options trading terms sound unfamiliar to you, make sure to learn the basics of options here if and when you decide to trade VXXB options. This brings us to VXXB. Since VXX ceased trading on January 30, 2019, Barclays introduced VXXB to the market that is more or less the same as VXX. Now, VXXB is very similar to VXX. VXXB’s maturity date is 30 years from the day it commenced trading – much longer than VXX’s 10-year life span. However, that doesn’t mean Barclay’s cannot decide to call the ETN, causing it to cease trading, before the maturity date. 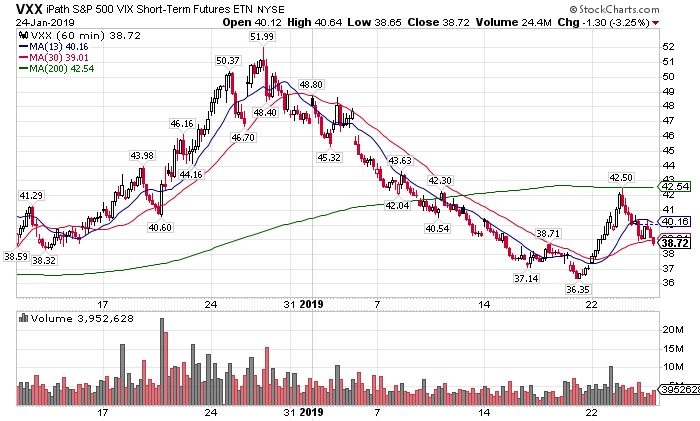 We’ve already seen this with XIV, that’s why it’s never a good idea to hold ETNs for extended periods. 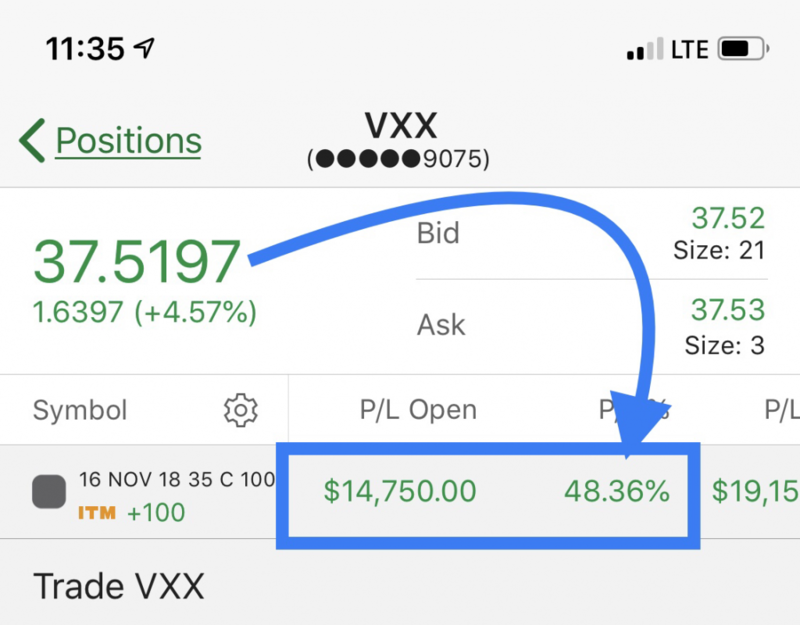 Currently, VXXB has relatively low volume, when compared to VXX – trading 1.1M shares per day on average, while VXX has an average daily volume of 45.68M. However, once VXX ceases to exist, VXXB should see an influx of volume – making it liquid with tight bid-ask spreads. Check out the hourly chart of VXX. Now, take a look at the hourly chart of VXXB. Looks pretty similar right? However, look at the volume bars on VXXB. You can see volume already picking up in this ETN. 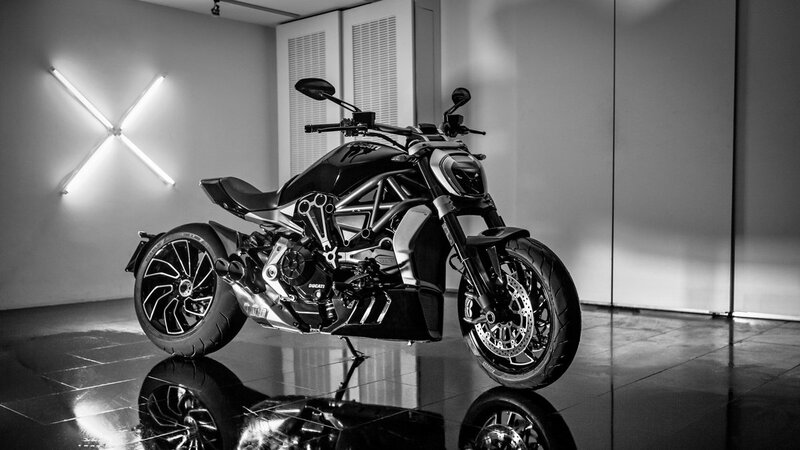 If you’re wondering how you can profit from volatility, make sure to check out this eBook. Now, to trade VXXB, I like to use VVIX, which measures the volatility of the VIX. In other words, it gives me an idea of when volatility could pick up. However, what I like to use most is the money pattern. I simply wait for a crossover. For example, I saw this in VXXB not too long ago. Here’s a look at the hourly chart of VXXB. 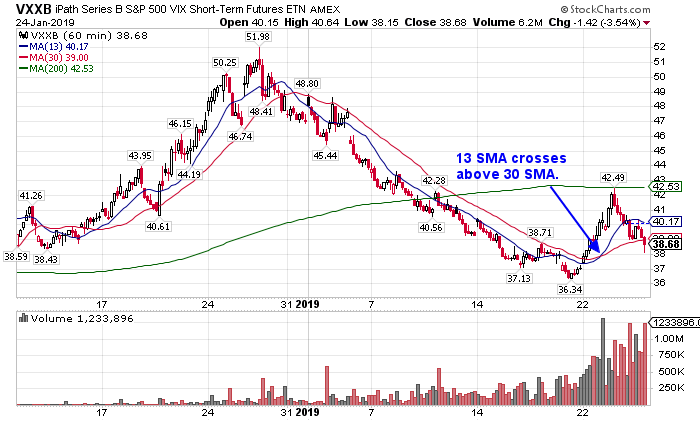 Once the blue line (13-period simple moving average) crossed above the red line (30 SMA), it signaled I should be looking to get into calls… which I did. In just a few days, I was locking in $50.75K in VXXB. Heck, I let Weekly Money Multiplier members know about my moves too. That said, trading VXXB could be profitable if you know what you’re looking for. The VIX is a barometer for market volatility, and lets traders know the sentiment of the market. You can gain exposure to the VIX through options, VXXB, or VXXB options. Now, when stocks are crashing, you’ll notice VIX and VXXB will catch a strong move higher. On the other hand, when the market is grinding higher, volatility is low – causing for VIX and VXXB to be at relatively low levels. 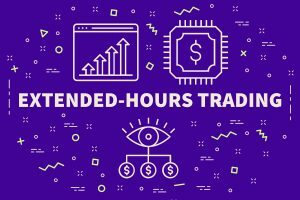 If you’re interested in learning about my trades shown earlier, check out this webinar.